Teen WISes learn about aquatic macroinvertebrates with Ben Perry from Backcountry Experience. The Wilderness Information Specialists in training started throwing rocks at a hollow log. The sound startled the mountain goats and they ran away. We rejoiced! We had chased the mountain goats out of our camp. Any nature-savvy individual knows that harassing wildlife is a faux pas. It stresses the animals and can scare them away from water or forage, thus leaving them in a weakened state and more prone to predation. But the mountain goats in Chicago Basin are not afraid. They love us. They want to get as close as they can. Why? Mountain goats normally live above treeline (above 12,000 feet in Southwest Colorado), but in Chicago Basin in the Weminuche Wilderness, goats can be spotted as low as 10,500 feet. They have moved lower to be closer to the salt people leave behind – especially our urine. Goats will destroy vegetation in order to get at the salty urine. Therefore, it is important for visitors to urinate on rocks or logs. And that is just one iota of what folks should know before visiting “The Basin.” There are volumes of information regarding the four W’s: Water, Weather, Wildlife and Waste. But how is a visitor supposed to know all this stuff? There are plenty of resources available online (search for SJMA’s “Chicago Basin Trip Planning Guide”), by phone and at the trailhead. But if a visitor gets all the way to The Basin without proper knowledge, a WIS there can explain proper etiquette and why it matters. On July 19-21, another guide and I took a group of six local teenagers to The Basin as WISes in training. Before the trip, the teen WISes had to complete an online training and test. This included general information about the Wilderness Act, wilderness regulations and a list of FAQs specific to Chicago Basin. By the start of the trip, these kids were ready! We hopped the Durango & Silverton train to Needleton. We began educating hikers and backpackers before we even got off the train. It took some prodding at first to get the teens to approach visitors, but by the third day, the folks hiking in could barely get past them without receiving an onslaught of wilderness information. The teens were nearly talking over each other to be sure that their information was heard. We talked to 91 visitors over three days! Weather: From July into September, afternoon lightning storms are a real threat. Be off the high summits by noon. Keep an eye to the sky and seek cover if the clouds look ominous. Water: Treat your drinking water in order to protect from the parasites giardia and cryptosporidium. Avoid getting water from sources contaminated by mines. Look for aquatic macroinvertebrates living in the water – this is a good sign. Also, camp at least 100 feet from any water sources in order to avoid compacting riparian soil and prevent scaring wildlife away from their drinking water.Waste: Pack out all your trash including toilet paper. Critters will dig up buried toilet paper. There are natural items that can serve as toilet paper. Pack out your human waste or bury it 6 to 8 inches underground at least 200 feet from any water sources. Wildlife: In addition to the mountain goats, be prepared to keep your food and salty gear away from marmots, chipmunks, bears and moose. Store salty gear (packs, poles, shoes, clothes) at least 5 feet up a tree or in an enclosed tent. When not in camp, store all food at least 10 feet up and 5 feet out. No campfires are allowed in the Needle Creek watershed.No mechanized or motorized use is allowed in designated wilderness, including drones.Most importantly, this isn’t just a list of regulations to ruin your fun. This is public land that is here for all of us to enjoy. We need to work together to keep it pristine for ourselves and future generations. In designated wilderness, “man is a visitor who does not remain.” Wilderness is nature in its natural state. It’s no secret that public lands are under fire right now. 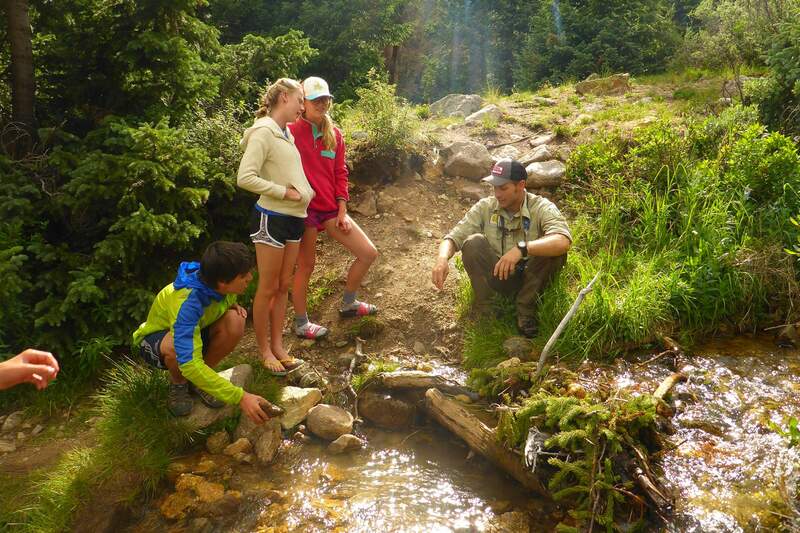 But here at the San Juan Mountains Association, we are training the next generation how to educate others to take care of these treasures that belong to all of us. This was the fifth annual teen backpacking trip, and I assure you that there will be more to come.